Beneath each medal is inscribed, the specific significance of the award, the campaign relevance and the year in which the award was instituted. All of the impressive pieces contained in The Collection are handsomely displayed in the finest timber and gilt inner edged moulded frame which measures 88cm x 94cm, and is the product of skilled and traditional handcraftsmanship. Sheltered and protected under glass, each individual medal has been meticulously affixed and aligned to a black background to embellished the richness of metal and enamels, and to highlight the elegance of each distinctive ribbon. 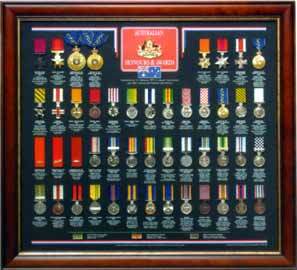 The cost of this display is: $1,950 + Freight – please email Medals of Service re postage charges.